Computers can do practically anything these days, but they're still a far cry from robotic brains that don't just do what they're told but actually think for themselves. The Semantic Pointer Architecture Unified Network, or Spaun, is one of those, and it's creeping up on human intelligence. Developed by neuroscientists and software engineers at the University of Waterloo in Canada, Spaun includes a 784-pixel digital eye, and a robotic arm for writing, but the real meat of it is its 2.5 million simulated neurons which are used to emulate parts of a human brain like the prefrontal cortex, basal ganglia, and thalamus. Using all those neurons, it can think through questions and solve limited problems the same way a human brain can, albeit in a much more finite sense. 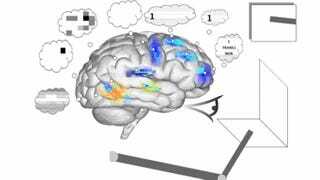 Even though its makers claim it is the "most complex" artificial brain in existence, it's tricks are pretty scant; it mostly does things like recognize patterns and (mis)remember long strings of numbers. Which is pretty much what it takes to be able to struggle through most of an IQ test, even if it's a low score. The impressive thing here isn't so much what Spaun can do, but what it can do considering it's built to act like a real, pulsing, fleshy brain.